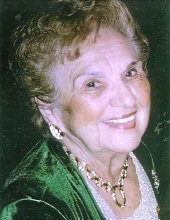 Mary Lazar died April 4, 2019 in Delray Beach, Florida. She was 95 years old. Mary was born June 25, 1923 in Detroit, Michigan. Mary believed in GOD, Family and Church, She was very active in and supported several churches in Michigan and Florida. In her youth and in Michigan: Saint Simon, Holy Trinity, Saint George, Saint Peter and Paul and the VATRA. In Florida: Saint Hermann and Saint Marks. Mary gave her support, time and money. Mary was a founding member of Saint George., Saint George Mother’s Club and the Orthodox Brotherhood. She was a strong supporter of AROY. Taking her children to AROY Conventions across the United States. She was an unwavering supporter of Archbishop Valerian and visited him in Portugal. She also supported her husband in every business venture and charitable activity that he thrust them into. Mary loved her family and always only wanted the best for them. Many children remember her kindness growing up and helping them through the illness and death of their parents. Mary loved and celebrated her Romanian heritage, her family, her friends and her faith She was one of a kind. The Mary stories will live on for generations. Mary believed in and trusted God to the very end. Mary is survived by her children, John Walter (Janet Henke) Lazar, Walter Mark (Susan Pampu-Lazar) Lazar and Annelle Ruth (JC) Costineau and grandchildren, John (Denise), Jason (Tracey), Georrfrey, Danielle (Bryan), Nicholas (Stephanie), Mark (Sarah), and Anthony (Angela). She is also survived by her great-grandchildren, Gabriel, Olivia, Samantha, Zachary, Nathan, Mia, Hudson, Corbin, and Lucas. Mary is preceded in death by her beloved husband, Walter Lazar, son, Gary Walter Lazar, parents, Nellie and Partinie Buibas, grandparents, Maria and Nicholae Buibas and Nastacia and Oancea Tatomir, sister, Aurelia Jacobs and brother-in-law, George Jacobs. A Funeral Service will be held at St. George Romanian Orthodox Cathedral, 18405 West Nine Mile Road, Southfield, Friday, April 12th at 10am. Friends may visit Thursday, April 11th, 5-8pm with a Saracusta at 7:30pm. Burial will be in Woodlawn Cemetery in Detroit. "Email Address" would like to share the life celebration of Mary Lazar. Click on the "link" to go to share a favorite memory or leave a condolence message for the family.